The full tang is a standard part of high quality knives because it allows the knife to stay whole, less prone to breaking off at the blade. The metal of the full tang inside the knife handle reinforces its level of strength. The partial tang comes down into the handle only partway and it has the advantage of being lighter in weight than the full tang, but it doesn’t have as much power or strength as the full tang. 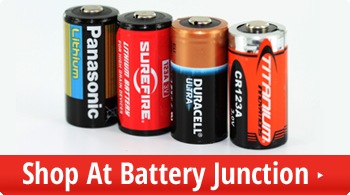 Yet it is tougher and more durable than other tangs like the hidden tang or rat tail/stick tang. The push tang is described as unfinished, as it can be shorter than other tangs, and it may not be as strong as other types of tangs, such as a full tang; it is also lighter than other tangs, like the full tang. 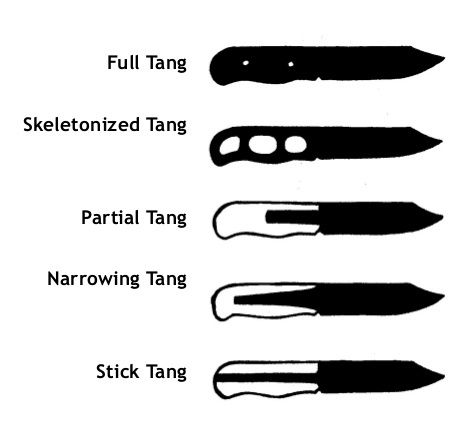 In order to assemble a push tang knife, the push tang is shoved into the knife handle and fastened there through use of an adhering agent. 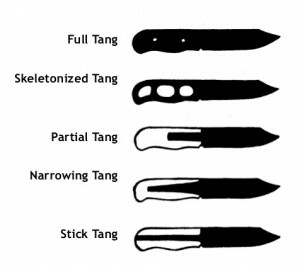 The skeletonized tang exists to have a knife tang out there that combines the formidable sturdiness of the full tang while sacrificing its heft, to the benefit of both the knife and the user. This tang style sometimes has holes and cut-out sections to lighten the load of metal inside the handle; this reduces the weight and gives the knife a sleeker look and feel, compared to other types of knives.